Oyster River Cooperative School District goes beyond academics to invest in the future of our students and our community. We contribute to a sustainable, clean environment through school practices like sourcing local, nutritious food and investing in energy efficient equipment – steps that simultaneously improve our district, reduce our carbon footprint, and lower costs for our taxpayers. Since September of 2017 we have stepped up our sustainable practices further by offsetting a portion of our electrical usage with solar panels. We worked with Brentwood, NH-based ReVision Energy to install a 22.12 kilowatt grid-tied solar electric system, ReVision Energy Website. 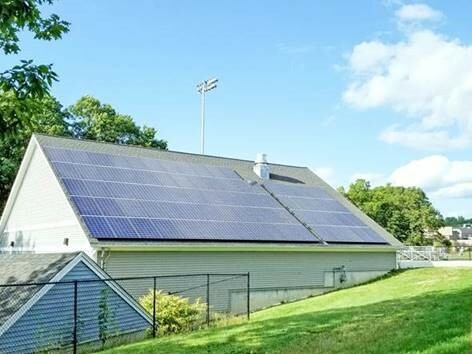 When the sun is shining, the 79 solar panels on the roof of Oyster River CSD’s maintenance building produce electricity that is either used in real-time by the district, or fed back to the grid where it benefits our community (and earns us a credit). Each year, the system will generate roughly 27,750 kilowatt-hours (kWhs) of electricity, offsetting the equivalent of driving over 50,610 miles in a gas-powered car. The project was financed through a Power Purchase Agreement (PPA), which means that the school district paid no upfront fee to install the solar panels. Instead, an investor (in this case, ReVision) pays for the upfront cost while the school district pays for the power generated from the solar panels each month, instead of paying for power from the grid. After a period of time, the school district can opt to buy the system from the investor (at a significantly reduced price) and own all the solar power generated outright! To see what our school’s system is producing today, and across its lifetime, visit the ORCSD Solar Energy Dashboard.